At Walker Ceramics we help take the guesswork out of mixing casting slip. The Litre Weight Bottle & Chart (HC80) along with the slip mixing record at the bottom of this page provide a consistent and accurate method of creating batch after batch of good quality casting slip. The plastic bottle comes with its own precise chart that details litre weights and gross weights, taking the hard work out of this process. Should you ever have a problem with your slip that you cannot remedy, by having a Walker Ceramics Litre Weight Bottle and Chart we can solve your problems through our technical support team as we use exactly the same method for creating our own casting slips. The amounts of Sodium Silicate or Dispex added to a casting slip are very critical and either too much or too little may result in the slip being too thick or too thin. If this happens, take a 1 litre sample of the slip and add one or two drops of Dispex or Sodium Silicate. If the slip becomes thinner after stirring then this shows that more is required to achieve good fluidity. If the slip becomes thicker then this shows that too much has been added already. Therefore more clay and water needs to be mixed into the slip in the same proportion as given in the casting recipe – with no more Sodium Silicate or Dispex. The recipe quantities can depend on the quality of the quality of the water supply, which may vary from one location to another, and may also be affected by minor variations in the body’s raw materials. On standing overnight the slip may thicken up slightly. This will easily re-blend when mixing is resumed, even by hand. We recommend that a film of water, approximately 2 mm thick, is placed on top of the slip after mixing. This will reduce water evaporation from the mix, especially in warmer weather. The most important part of successfully mixing casting slips is getting the correct litre weight. For easy, accurate litre weight measurement contact Walker Ceramics for a Litre Weight Bottle and Chart (HC80). Great care is needed to avoid contamination, particularly from plaster moulds. All scrap should be kept in sealed containers in a plastic condition. Dry scrap will promote air inclusion in the slip. Recycle by adding a maximum of 20% of scrap to a new mix. More than 20% can effect the quality of the slip. We recommend adding barium carbonate (BaCO3) (BA80) to the mix of recycle and new slip to “remove” the sulphates, which may affect fluidity set up and also cause peeling faults. The amount of barium carbonate to add should be approximately 0.1% (25 gm per 25 kg bag) of the total dry weight of clay and scrap. Everybody who casts suffers from time to time from some form of casting trouble. Experience throughout the industry, combined with the extensive work done on casting slips in our laboratory, has enabled us to connect the various faults with measurable properties of the slip. Of course, other factors besides slip properties can cause casting faults but usually they can be easily noticed, for example: wet moulds can cause slow casting, careless filling can cause ‘pinholes’ or ‘casting-spots’, etc. The table below gives a brief description of some common troubles and the suggested remedies. This only gives the direction in which to move and it is up to the individual to determine how far they need to go. For example, say you were incurring flabbiness and when you increased the Dispex addition to correct this you found that your ware became brittle with casting spot, then you would know you had gone too far or you should try increasing the sodium silicate instead. In all our slip recipes we recommend a maximum of sodium silicate – adjustment should only be made to Dispex. Before making any adjustments make sure the litre weight is within the stated limits for the body. Use our easy Litre Weight Bottle and Chart. 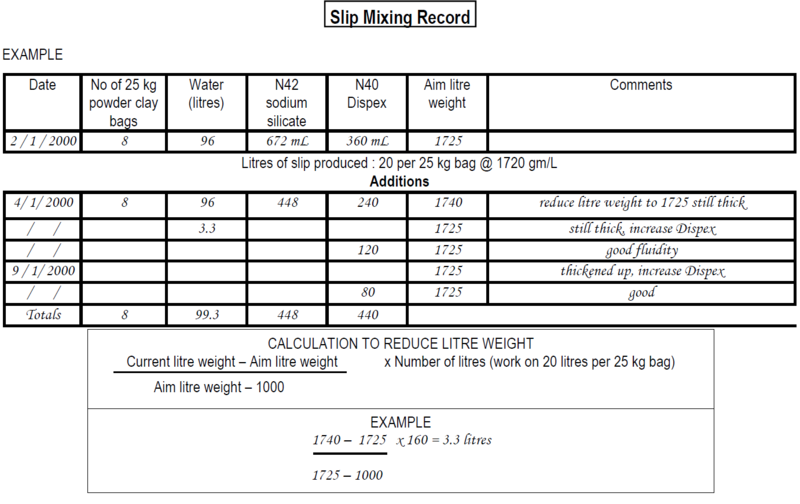 Using the slip mixing record set out below enables you to refer back to your previous batches and maintain the consistency and quality of your casting slips.